The present School Street schoolhouse is now serving its twenty-fifth anniversary year. I believe however that any historical sketch of the building should not omit its predecessor which served so prominently in education in our town. Therefore, I shall give a brief history of the Old School Street building as a preface to that of the new school. The old School Street building at one time contained all the public schools maintained in Middleboro [center]. The building represented the consolidation of three schoolhouses, one located at the corner of Wareham and Wood Streets, another on South Main Street near the site of the residence of the late Hon. M. H. Cushing, and the third on North Main Street on the land now belonging to the Peirce estate and known as the "Orchard Lot". The report of the school committee for 1850-51 contains the following record of the change: "District No. 37 and a portion of No. 1 have be united to No. 18 the past year. They have unitedly built a large and commodious schoolhouse, which, with the grounds an improvements cost more than six thousand dollars, making it one of the best schoolhouses in this section of the state. The house is intended for grade schools, with departments for the primary, intermedial, and grammar grades. The winter schools commenced in the new house with the Misses Potter as teachers in the primary and intermedial departments, and Ephraim Ward, Jr., in the grammar department, who was succeeded with expiration of engagement by John Willis, whose term has not expired." The committee reported in March, 1852, that the whole number attending school in District No. 18 during the summer term was 173. The primary classes were taught at this time by Miss Sarah T. Holmes, who was succeeded the following year by Miss Mary L. Tinkham who completed thirty years of teaching in the School Street building resigning in 1880. Other teachers whose names are connected with the period when the School Street School building was the only one at the Center are Amos Sherman Jr. who had charge of the grammar department in the late fifties and won much popularity; Ichabod F. Atwood, late of Rock, who was principal about 1861; Matthew H. Cushing about 1867; and Miss Harriet C. Barden who was teacher in the intermedial and grammar departments for about sixteen years, from 1860 to 1876, when she became the wife of the late Joseph E. Beals. Misses Marion G. Pratt (afterwards Mrs. David G. Pratt), Annie A. Lovell and Lucia A. Drake were also among the teachers in the different grades in the building. Upon the completion of the Union Street building in 1875 the primary grades were removed to that building and in 1887 when the High School was completed the grammar grades were removed leaving only the intermediate grades. In 1888 the front entrances were altered, the winding stairs removed, and the entrances to the upper and lower floors made entirely separate; a furnace was also substituted for stove. In 1895 the first and second grades were transferred from the Union Street School to the School Street building and the third, fourth and fifth from it to Union Street. During the period that the new School Street building was under construction the old house was moved to the rear of the lot and fitted to hold three grades while the remainder of the pupils were placed in the two rooms fitted up in the [Congregational] Chapel building. Later [the old school] building was moved o its present location on Center Street and is known as the Briggs block. In the report for the year 1906 we find the following report of the new building: "The most important action by the town the past year in the matter of school accommodations was the appointment of a committee to investigate the need of better school accommodations and the subsequent action voting to erect an eight-room brick building on the site of the old building on School Street. The committee having charge of the erection of the new building consists of Hon. David G. Pratt, William A. Andrews and William M. H. The committee succeeded in placing the contract so as to keep within the appropriation and the building in every way well equipped for school purposes and an ornament to the town, will be occupied at the opening of the fall term in September The building is being erected by the firm of F. P. Cummings Co., of Boston according to plans and specifications of Cooper & Bailey, Boston architects"
"It will be an eight-room brick building, with stone trimmings and slate roof, 80 x 85 feet, each room being 28 x 32 feet, 12 feet in height, and capable of seating 48 pupils." "The teachers' entrance will be in front, the boys' entrance being on the left side and the girls' entrance on the right. The blackboards will be of the best slate. The building will be fitted for gas and electricity and a complete system of telephones and electric bells will be installed. The Fuller-Warren combination furnace and steam heat and ventilation will be used, the rooms being heated by hot air, and the corridors and teachers' rooms by steam. In order to have the work satisfactorily performed, the building committee secured Mr. John A. Jackson of Brockton as local supervisor." The building was finished in April 1907 but was not used until September of that year. Space will not permit the printing of the names of all teachers who have served in this building so the names of the Principals will be here listed. 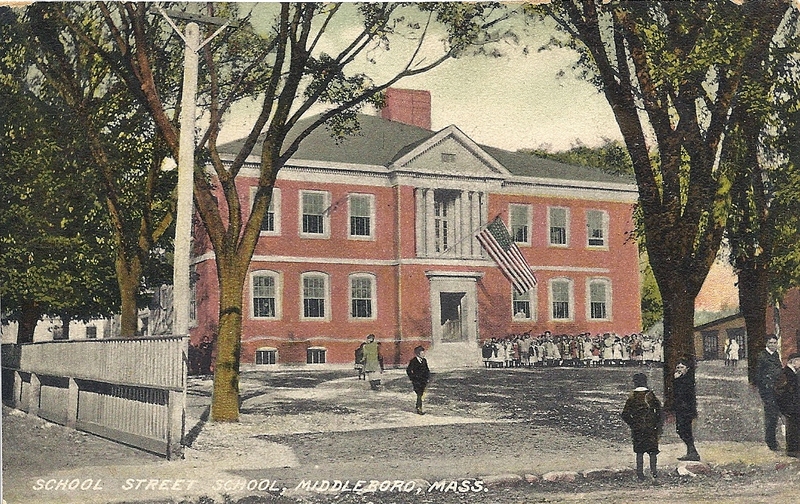 (In 1961, the School Street and Union Street Schools were unified as the Central School District of Middleborough at which time Gross was named to serve as principal of the district).